We are a monthly publication whose focus is on providing answers to questions from persons of all ages about every topic of interest to anyone. If we are asked a question...we get an answer for it. We maintain relationships with over 300 contributing writers...with over 6,000 years of combined experience doing what they do. These writers are people who own, operate or manage their own businesses. They provide the answers in a non-commercial fashion so as to inform and educate our readers. 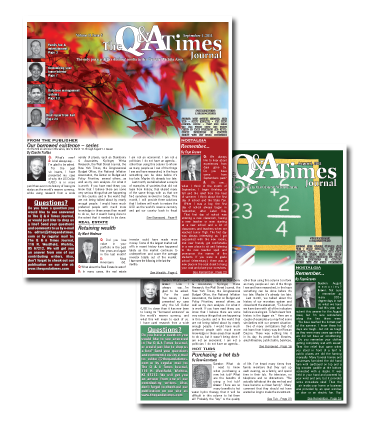 Unlike most “stand-alone” publications...The Q & A Times Journal is a supplement to existing publications, much like PARADE Magazine, as well as direct-mailed to more upper-income households and businesses than any other publication. If you would like to find out more about including our publication as a supplement to your own, contact us today. If you would like to subscribe, click the “Subscribe” button.